Rise Heart; Thy Lord is Risen! But your dead shall live, their corpses shall rise! Awake and sing, you who lie in the dust! And you cause the land of shades to give birth. We accompanied him to the Cross and from it to the grave. And it seemed all was done. The depths, the shades of darkness for a time covered the earth. His Mother bears his lifeless body in expectant hope. The heart that a sword would pierce was pierced, and hers becomes the first altar of sacrifice. 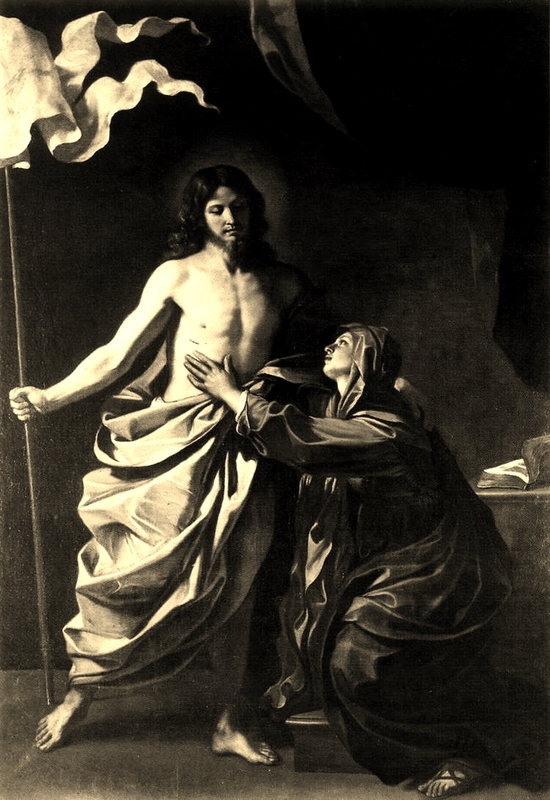 In her somber strength, she bears Him yet gain for the salvation of the many. The women come with their oils, the fragrant offering of incense; the myrrh brought to Him long ago in that manger by kings from foreign lands is now used to anoint Him in the still end of his life. Those linen cloths covered his body. The same linens that once held the hidden remains of the Christ, now cover our altars of sacrifice. All these, rituals of an ancient past, brought to bear on the One who fulfilled that past and all its waiting. A strange silence filled the land, for God was dead. One life, one death, and one night watch of faith that death would be trampled and the dead might rise! And when among the dead He seemed gone and lost, alas, they came to weep and found Him not. ‘He has gone to search for our first parent, as for a lost sheep. Greatly desiring to visit those who live in darkness and in the shadow of death, he has gone to free from sorrow the captives Adam and Eve, he who is both God and the son of Eve. –From an ancient homily on Holy Saturday, Office of Readings. Since then this command repeats anew. Arise! Processions in time behind paschal candles have shed light in the darkness–and ushered Easter mornings. The light stands witness of this one tremendous outpouring of love and life; a pillar strong and burning brightly as dew in a land parched for light, and thirsting for love. Rise, among the gardens of this world! Live, long live, the victory over sin and death! Against the wars, the lies, the disbelief. Behold, your Light has come! Come among the children of the Eve you love! Offered to you, fragrant at Thy empty tomb! Souls are filled with hope! O Risen One, with life unending. The land of shade in bloom awakens! On His grave’s cold and hardened floor. For I am the life of the dead! Rise up, work of my hands! Let us leave this place! Thy Lord is Risen! Alleluia, Alleluia!